Interstate 675 angles northward from Interstate 75 at Stockbridge to Interstate 285 in south Dekalb County on the Southside of Atlanta. The 11.04-mile freeway provides an alternate route between I-285 and I-75 while also doubling as a commuter route to the Clayton County suburbs. Interstate 675 follows the southern extent of the planned Interstate 475 / Georgia 400, which was slated to run from Clayton County north to Buckhead in Atlanta and Interstate 285 at Sandy Springs. I-475 was applied to the west Macon Bypass, which opened in 1967. 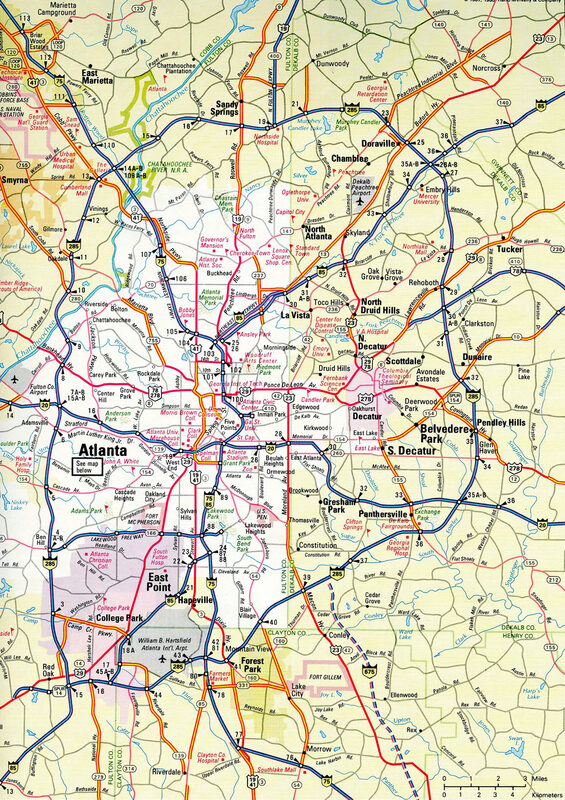 The Georgia 400 freeway north of I-285 in south Dekalb and south of I-85 at Buckhead was never built, and the portion between Buckhead and Sandy Springs was constructed as a toll road. Future road work involving Interstate 675 takes place starting in 2019 at the north end. The I-285 Bouldercrest Interchange Improvements project adds collector distributor roadways to both sides of the Perimeter Highway to separate weaving traffic between I-675 and Bouldercrest Road (Exit 51). Interstate 675 under construction in 1987. Interstate 675 northbound peels away from Interstate 75 north via a wye interchange at the city of Stockbridge. Meeting the freeway ahead is Georgia 138 (Stockbridge Highway), an 59-mile east-west route between U.S. 78 & Georgia 10 at Monroe and Georgia 92 near Fairburn. Photo taken 10/22/15. Replaced by July 2012, the first reassurance markers for Interstate 675 included button copy numbering and lined both sides of the freeway. Photo taken 12/23/00. Second photo taken 05/28/05. Construction completed in January 2017 added connections from the I-75 South Metro Express Lanes to Interstate 675. Photo taken 10/22/15. Entering Clayton County, Interstate 675 north reaches the off-ramp (Exit 1) to Georgia 138 (Stockbridge Road). Stockbridge represents a suburban community in western Henry County along U.S. 23 & Georgia 42 (Henry Boulevard). Stockbridge existed as early as 1829 when the Old Stockbridge Concord Methodist Church was organized, and later as a crossroads community before the Civil War. Citizens living in the area applied for a post office and decided to name their community Stockbridge after a Yankee school teacher by the same name. The post office was established on April 5, 1847. By 1881 the Southern Railroad came to the village on its routing between Macon and Atlanta. In 1882, construction of a depot south of Old Stockbridge commenced and the town recentered itself around that location. Stockbridge later incorporated in 1895 as a town and as a city on August 6, 1920. The original railroad depot was dismantled around 1980.3 Photo taken 10/22/15. This scene looks at the slow rolling hills of the southern Appalachian Piedmont along the freeway near Panther Creek. Photo taken 05/28/05. Interstate 675 is designated the Terrell Starr Parkway, named for Georgia State Senator who had a perfect attendance record between 1969 and 1995.4 Photo taken 05/28/05. Motorists along I-675 north next encounter U.S. 23 & Georgia 42 (Macon Highway) at a diamond interchange (Exit 2). The tandem travel northwest from Stockbridge through unincorporated Clayton County suburbs to Fort Gillem. Photo taken 06/24/10. All signs for Exit 2 were missing northbound with the exception of the gore point. U.S. 23 & Georgia 42 parallel the west side of Interstate 675 north from Exit 2 to I-285. Photo taken 10/22/15. Posted ahead of the Double Bridge Road overpass is the one-mile guide sign for Exit 5 (Forest Parkway to Ellenwood Road) on Interstate 675 north. Forest Parkway comprises an east-west arterial west from Panola and Bouldercrest Roads nearby, through the cities of Lake City and Forest Park to the west. Photo taken 10/22/15. Exit 5 serves Clayton State University and the Georgia and National Archives. Situated just west of the Clayton University campus is Gateway Village, an economic development that began in 1999. The community houses the Morrow campus of the college, office space, a high tech executive conference center, student housing, and an intermodal transportation center. One of the Gateway Village centerpieces includes the 2005-opened National Archives and Records Administration&apos;s Southeastern Archives facility.5 Photo taken 05/28/05. A diamond interchange joins Interstate 675 with Forest Parkway. Ellenwood Road spurs south from Forest Parkway, just east of Exit 5, into the community of Ellenwood. Ellenwood centers along side a Norfolk Southern Railroad just south of the Forest Parkway transition into Panola Road east to Henry County. Photo taken 10/22/15. Interstate 675 bends northwest to span the NS Railroad on the 0.75-mile approach to Exit 7 with Anvil Block Road to the Fort Gillem redevelopment site. Fort Gillem, named for Lieutenant General Alvan C. Gillem, Jr., was established in 1941 as the Atlanta General Depot. The facility entailed training and supply operations during conflicts ranging from World War II to the Vietnam War before shifting operations to a satellite installation of Fort McPherson. The transfer of duties occurred on June 28, 1973 to coincide with the renaming to Fort Gillem.6 Photo taken 10/22/15. Northbound at the ramp departure (Exit 7) for Anvil Block Road on Interstate 675. Anvil Block Road travels east-west between U.S. 23 & Georgia 42 at Fort Gillem and Fairview Road in Henry County. Fort Gillem closed as a military base in 2011. Photo taken 10/22/15. Interstate 675 lines the eastern periphery of an industrialized corridor at Conley to the DeKalb County line at Conley Creek. Photo taken 10/22/15. Attached to the Cedar Grove Road overpass is the first in a series of diagrammatic overheads for the directional T interchange with Interstate 285, the northern terminus of I-675. Photo taken 10/22/15. Interstate 285 travels west to Hartsfield-Jackson Atlanta International Airport (ATL) and College Park, providing links to Interstates 75 & 85 (Downtown Connector) for central Atlanta. Interstate 285 northbound serves the Dekalb County suburbs, Clarkston and Stone Mountain en route to Spaghetti Junction (Tom Moreland Interchange) with Interstate 85 near Doraville. Photo taken 10/22/15. A pair of end shields for Interstate 675 stand at the Henrico Road under crossing. GADOT generally signs the end of Interstate highways well within the Peach State. Photo taken 05/28/05. Second photo taken 10/22/15. Third photo taken 05/28/05. A supplemental overhead touts the Interstate 285 north (outer loop) connections to Augusta via Interstate 20 (Exit 46) and Greenville via Interstate 85 (Exit 32). Interstate 285 meet Interstate 675 at Exit 52. Photo taken 10/22/15. Two lanes depart for both directions of Interstate 285. 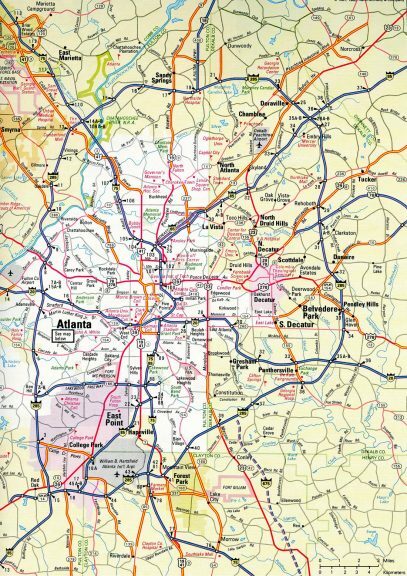 I-285 (inner loop) meets Interstate 75 within five miles outside ATL Airport and Interstate 85 in ten miles at the northern turn to East Point and west Atlanta. Photo taken 10/22/15. Motorists taking the westbound ramp for Interstate 285 are provided with a slip ramp to the adjacent diamond interchange (Exit 53) with U.S. 23 & Georgia 42 (Moreland Avenue). Photo taken 10/22/15. Ramps from both Interstate 285 east and U.S. 23 & SR 42 (Moreland Avenue) to I-675 south combine just ahead of the Henrico Road underpass. Photo taken 06/12/17. Interstate 675 south reduces to three lanes ahead of the Cedar Grove Road overpass. A sign for Terrell Starr Parkway takes the place of the first I-675 confirming marker. Photo taken 06/12/17. Curving southeast, Interstate 675 separates industrial areas along the parallel Norfolk Southern Railroad with subdivisions to the east. Photo taken 06/12/17. The first exit from Interstate 675 south serves the Fort Gillem redevelopment site and the suburbs of Conley and Forest Park to the west. Fort Gillem closed as a military installation in 2011. Photo taken 06/12/17. Interstate 675 crosses from southwest Dekalb County into northern Clayton County ahead of the Grant Road overpass. Photo taken 06/12/17. Entering the diamond interchange (Exit 7) with Anvil Block Road along I-675 south. Anvil Block Road leads west to U.S. 23 & SR 42 (Moreland Avenue) at Fort Gillem and east to Fairview Road in Henry County. Photo taken 06/12/17. Interstate 675 bends curves southward on the one mile approach to the diamond interchange (Exit 5) with Forest Parkway. Forest Parkway runs west from Bouldercrest and Panola Roads, at Ellenwood to the east, through both Lake City and Forest Park to Interstate 75. Photo taken 06/12/17. Nearing the Norfolk Southern Railroad underpass along Interstate 675 south. Forthcoming Exit 5 serves interests to Clayton State University via Forest Parkway south to North Parkway and the city of Morrow. Photo taken 06/12/17. Exit 5 leaves Interstate 675 south for Forest Parkway. Ellenwood Road ties into the east-west arterial nearby from the community of Ellenwood. Photo taken 06/12/17. Continuing south, I-675 reduces to a four-lane freeway beyond the Double Bridge Road overpass. Photo taken 07/05/14. Parallel U.S. 23 & Georgia 42 (Macon Highway) wind eastward to cross paths with the freeway at a diamond interchange (Exit 2) in one mile. This guide sign was missing by 2013 and remained unposted as of June 2017. Photo taken 05/29/07. Evans Drive spans Interstate 675 south as Exit 2 parts ways for U.S. 23 & Georgia 42 (Macon Highway). Beyond the Henry County line, U.S. 23 follows Henry Boulevard through the city of Stockbridge. Photo taken 07/05/14. Interstate 675 ends two miles ahead at the separation with the I-75 South Metro Express Lanes. Variable message signs indicate whether the reversible roadway is open to traffic. Photo taken 06/12/17. Residential subdivisions front both sides of I-675 ahead of Panther Creek and the diamond interchange with Georgia 138 (Stockbridge Road). SR 138 west provides access to Interstate 75 leading back north to Forest Park and Atlanta. Photo taken 06/12/17. Tolls along the I-75 South Metro Express Lanes use congestion pricing, where rates increase during heavier traffic in an effort to maintain highway speeds. Photo taken 06/12/17. The Interstate 75 managed lanes run 12 miles south from I-675 and SR 138 to SR 155 at McDonough. The lanes were completed in January 2017. Photo taken 06/12/17. East from Exit 1, SR 138 combines with U.S. 23 & SR 42 (Henry Boulevard) through Stockbridge. The state route lines a commercial arterial west to I-75 at Exit 228. SR 138 continues from there west to Jonesboro and an end at Fairburn. Photo taken 06/12/17. Motorists taking the I-75 Express Lanes travel 7.5 miles south from I-675 to the first egress point. Photo taken 06/12/17. A left side ramp departs from I-675 south for the South Metro Express Lanes as part of the reconfigured wye interchange with Interstate 75. Photo taken 06/12/17. Continuing south from the ending Interstate 675 to the South Metro Express Lanes. Photo taken 06/12/17. The managed lanes use all electronic tolling, requiring motorists to have a PeachPass transponder, or an interoperable transponder from another toll agency. Photo taken 06/12/17. Interstate 675 traffic merges onto the left side of the South Metro Express Lanes. Photo taken 06/12/17. Removed by 2007, a pair of button copy end signs were posted just south of the Henry County line. Photos taken 01/17/04. Georgia 138 (Stockbridge Road) eastbound approaching the diamond interchange with Interstate 675. Stockbridge Village Shopping Center fronts the state route and interchange to the southwest. Expansion of Stockbridge Road here resulted in the removal of this shield assembly. Photo taken 01/17/04. Button copy shields for Interstate 675 directed motorists from Georgia 138 east onto southbound toward Macon and ahead to northbound for Atlanta. These were replaced with non-button copy based signs. Georgia 138 east merges with U.S. 23 & Georgia 42 (Henry Boulevard) in one half mile, where the three routes commence a 3.5-mile overlap through Stockbridge. Photo taken 01/17/04. A third Interstate 675 button copy shield was posted at the southbound on-ramp facing westbound motorists along Georgia 138 (Stockbridge Road). GA 138 continues beyond this ramp 0.75 miles to a diamond interchange with Interstate 75. Photo taken 01/17/04. "I-675 open to traffic." The Atlanta Journal and The Atlanta Constitution, November 5, 1987. "I-675 opening seen as boon to Clayton - Road linking I-75, I-285 expected to spark south metro development." The Atlanta Journal and The Atlanta Constitution, October 30, 1987. Senate - Hon. Terrell A. Starr (GA SS 44), Georgia General Assembly http://www.legis.ga.gov/legis/1999_00/senate/gass44.htm. 01/17/04 by AARoads and Justin Cozart.